Geocaching is an outdoor activity of electronic 'treasure hunt'. The geocacher or treasurer hunter uses a Global Positioning System (GPS) principally a handheld GPS device to locate hidden treasures at a specific GPS location. These locations are often referred to as 'caches' or 'geocaches', and more often than not the 'treasure' is plastic container containing a logbook and pen/pencil for the finder to write the date/time the geocache was discovered. Some geocache locations also contain trinkets e.g. a small figurine or keyring, the idea is that the finder can swap out the item for another that they have. 1. First log onto a website such as geocaching.com and find the latitude and longitude co-ordinates of hidden containers, called geocaches. A description of the area is also provided detailing the terrain, etc. 2. Secondly, you enter or download these co-ordinates into a GPS-enabled device and usually walk/hike to the geocache. There is usually a small gift (cuddly toy, etc.) that you take out at the cache site and replace it with something else and then you note down you were there in a log book (provided at the location). 3. Finally, you share the location on the internet with other potential geocachers so that people can see how popular the geocache is. The map pictured right shows geocache locations near Bournemouth, England. The Geocaching Association of Great Britain (GAGB) was set up specifically for geocaching in the UK. Established in 2003 the GAGB aims to establish good geocaching practices and provide a focal point for public liaison and supporting the growth and enjoyment of Geocaching within the UK. Please visit the Geocaching Association of Great Britain website. Here at ActiveGPS we sell various handheld GPS devices perfect for Geocaching. When considering which handheld GPS system to buy, it's best to consider the following: unit size, screen size and battery life. It also worth considering whether you'd like a GPS system with a monochrome or colour display, whether you'd like it to be touchscreen and finally whether you like the ability to load additional maps via SD/microSD Card such as the popular TOPO mapping series. Below we take you through three different GPS handheld units, all perfect for geocaching, but all priced for different budgets and with different features. Do you have a question about the Garmin handheld's? Please see our handheld and Outdoor GPS FAQs page for questions from other customers.Plus if the answer to your question isn't featured, use the online form to ask us for the answer. 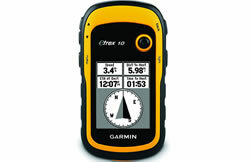 Garmin eTrex 10 is a basic handheld GPS device. It has a simple 2.2-inch monochrome display and comes preloaded with a worldwide basemap. The eTrex 10 system supports paperless geocaching so this eliminates the need for carrying paper with you showing information about each geocache site. As this device supports GPX files it will store details of each cache location such as terrain, difficulty, hints and descriptions. It is rugged and waterproof to IPX7 standards and has a battery life of 25 hours. However, a limitation of the eTrex 10 is that there is no SD/microSD Card slot which means you can't easily upgrade the mapping on this device with a SD/microSD Card. The Garmin eTrex 10 units dimensions are Width - 54mm, Height - 103mm, Depth - 33mm. 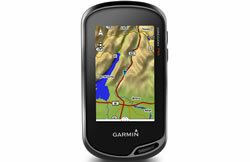 The Garmin Oregon 750 is a mid-range handheld GPS system. The screen however is currently the best available within the Garmin handheld range. The Oregon 600 features a transflective 3-inch TFT colour touchscreen display which uses technology that allows you to dim the screen and rely on sunlight instead. The Oregon 750 system also features built-in 8 megapixel digital camera, electronic compass and barometric altimeter and can be powered via either 2x AA batteries and NiMH battery pack both providing up to 16 hours of battery life. The Garmin Oregon 750 also supports paperless geocaching so it stores full descriptions, cache photos, hints and logs and can store up to four million geochaches! This Oregon 750 is preprogrammed with a worldwide basemap and you can further upgrade the mapping for use on foot, on a bike, in a car or on a boat thanks to the units built-in SD/microSD Card slot. Mapping available to buy includes Topographical maps, GB Discoverer maps, City Navigator NT maps and BlueChart g3 marine charts. The Garmin Montana 680t is a premium handheld device. It has a colour sunlight-readable 4-inch touchscreen. It also features a 5-megapixel camera, an electronic compass and barometric alitmeter and is waterproof to IPX7 standards. The mapping preloaded to the device is European Topographical maps. These topo maps provide rich map data with contours, elevation, roads and rivers, etc. The scale of these pre-installed topo maps is 1:100k. Furthermore, the mapping capabilities can be expanded for use on foot, on a bike, in a car or on a boat using the units microSD card slot. These maps include GB Discoverer OS LandRanger maps, City Navigator NT Maps and BlueChart g2 marine maps. There is a choice of battery power between 3x AA batteries and lithium-ion pack providing a battery life of 16 and 22 hours respectively making a total of 38 hours worth of battery power when both are combined. 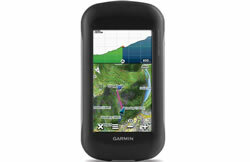 The Garmin Montana 650t units dimensions are Width - 74.8mm, Height - 144.2mm, Depth - 36.4mm. 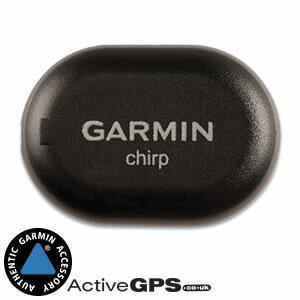 Garmin have catered for geocachers with a chirp geocaching beacon that is designed to be left at the geocache location to help people with Garmin handheld GPS systems find the geocache. Chirp is a wireless beacon. At £19.99 it is affordable, durable and waterproof. The chirp stores hints, multicache coordinates, counts visitors and confirms the cache is nearby. Chirp is also password protected and has a battery life of up to one year. For further help on deciding the best handheld GPS system to buy for your needs or maybe as a gift for somebody else, please see the product pages via the links to the left or by visiting the handheld GPS product range. If you have any further querstion please telephone 01733 777623 (Mon-Fri 9:30am-5pm). outside of these hours please contact us.